Sorry, folks. Sounds like Dead Island's DLC pack is going to stay buried for a little longer. Earlier this month, Techland announced that it was taking a little longer than it planned to get DLC out for the game. This was because the studio was working on ironing out the various bugs that plagued the game when it was first released. Today, Techland has revealed that the "Bloodbath Arena" DLC will be delayed even longer due to the these clean-up efforts. We are working hard to make the Bloodbath Arena DLC available as soon as possible. However, due to further polishing of the main game the finalisation of the DLC code has been delayed. We know that many fans are eagerly waiting for it and apologise for any inconvenience. We expect to announce a release update next week. Bloodbath Areana is the DLC that was announced before the game was even released. 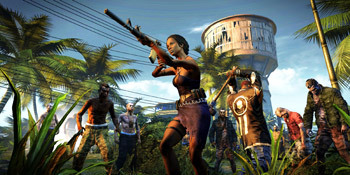 Susan's review of the game noted that it's an enjoyable zombie romp, in spite of its "rough edges", and Dead Island has been reportedly been selling incredibly well since then.